New Web 2.0 technologies have been eagerly adopted by educators both for on-line and for face to face teaching. These relatively simple technologies have been found to be extremely effective for supporting teaching, for cultivating student creativity and student interaction with their peers. This chapter explores a specific example of such adoption by an Australian academic both within his home university (Australian Catholic University) and with groups of disadvantaged students seeking alternative paths to university entrance. Within the context of an overview of the emergence of this technology during the last two decades, this chapter explores the successes of this particular adoption, but also identifies problem areas and suggests pathways for the future. In this paper, we present a study in which an English Literature and writing unit was constructed around blogging activity. This unit was offered as a community and adult education programme in conjunction with a non-governmental organisation for adult learners (Australian Catholic University in conjunction with Mission Australia- The Clemente/ Catalyst Program for the Homeless and Disadvantaged). Adult learners, it is argued learn differently from young people (Knowles, 1990). 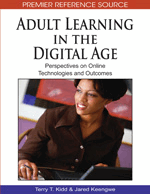 For Knowles, effective adult learning practices need to incorporate the following: self-directed learning as the preferred model, capitalising on adults' experiences as a rich course resource, a problem-based rather than subject-centred approach and the importance of a social context for learning. As such, any courses developed must be flexible, incorporate choice (as to materials and subjects for study), involve self-expression and integrate learning with their experiences (Mason, 2006). With these principles in mind, students in small groups were encouraged to set up and maintain a blog as a portfolio of their work. In the paper, we discuss the role of blogs in providing a social mechanism for the student body and also as an outlet for classroom and practical examples. We show that students have utilized the blogs creatively and interwoven their blogs with their personal stories. These have proved to be an extremely useful and an effective tool for the adult learners (McDrury & Alterio, 2003). We also consider the limitations of blogs and argue that a supported and pedagogical approach to blogging environments is needed for them to be effective. The paper concludes by proposing the development of a Personal Development Planning process that we argue will enable further development and empowerment of adult learners.